Kerala Kayaking, one of the best-known adventure companies around here, offers experiences that introduce you to the beauty of the backwaters and the rich bird life that thrives here. Want to explore Kerala’s famed backwaters the traditional way? 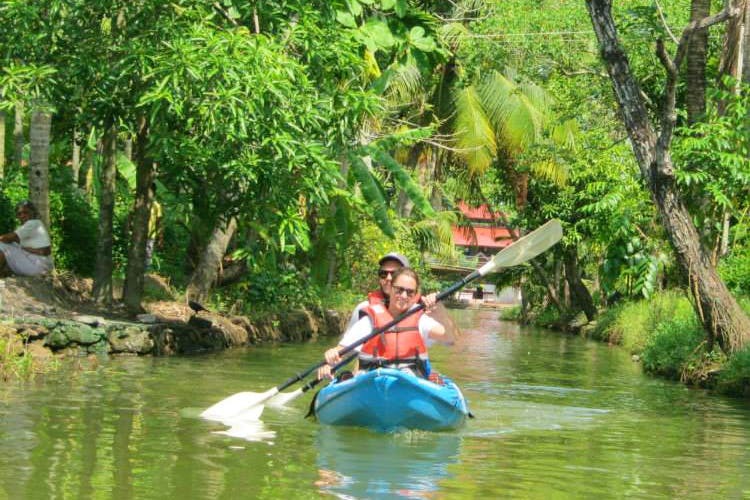 Then, sign up for a kayaking experience with Kerala Kayaking. While there are plenty of adventure companies in Alleppey, Kerala Kayaking is not just one of the oldest but also a crowd favourite. With them, you can opt for four, seven, and ten-hour tours that see you snake through the backwaters and network of canals that surround. These are priced between INR 1,500 and INR 4,500. The kayaking experience is best suited for those of you who think the houseboats are a bit out of your budget. And if you’d like to go where the houseboats can’t. The large houseboats can only roam around large water bodies and can’t navigate the canals. This is, of course, not a problem for compact kayaks. However, while you don’t need kayaking skills, you need to know how to swim. If you are unsure of your kayaking skills? Then, opt for the double boats where you’ll be accompanied by an instructor. For those of you wearing your confidence on your sleeve, single boats are available. You will still, however, be followed by an instructor who’ll show you the way. The kayaking trip is usually broken into 45 minutes of rowing after which you’ll break to catch your breath or for a delicious breakfast or lunch. The company provides waterproof bags so don’t leaving your camera behind. You’ll want to capture the splendid scenery unfolding around you. There are the endless backwaters and the groves that surround them. You’ll also go past green fields and witness everyday scenes from hamlets that line the canals. This exploration is also a great way to spot the abundant avian life here. Kingfishers and woodpeckers are common. Storks, Asian Palm Swifts, Greater Coucals, and Feral Rock Pigeons are also part of the ecosystem here. And dare we say, it’s a brilliant workout! Hello, strong arms and core.